Citation: Lazauskas P. The law of the field crop performance productivity. J Agric Sci Bot 2018;2(3):24-33. Weed control, Phytocenotic, Agrophytocenology, Herbicide. Soil tillage in spite of its importance is the sphere of economic activity of the residents earning the least income. Tillers have no opportunities to finance soil tillage scientific research. Consequently, the discipline of soil tillage till the very 21st century has not become a recognized science and till present is based not on abstract scientific- theoretical laws, it is still mostly founded on sensual empirical experience. Due to that in the present soil tillage before conducting research there is no opportunity to propose theoretically based hypotheses, during the studies only sensual, weighing data and data of other measurements are gathered, their accuracy, substantiality of differences is calculated and basing on it conclusions are arrived at. The information collected only according to experience is accumulated slowly, it is highly-priced and the obtained data are often of only local significance. As there was no theoretical soil tillage foundations, and no scientific prerequisites for viable development of soil tillage science, scientific improvement of soil tillage technologies and implements. Due to that serious contradictions between the postulates published in soil tillage textbooks and concrete practices which do not exist in the disciplines based on science cannot be avoided. The most obvious contradiction between the traditional textbooks on soil tillage subject and present practice exists during the discussion on the aims and tasks of soil tillage (loosening). In the textbooks and studies on soil tillage many authors of the world without reasoned evidence state that the most important task of soil tillage is the loosening of the superficial soil layer, so that in it aeration would increase, favourable air, humidity and warmth status could be created, the performance of micro-flora would be activated. In this way the decomposition of the organic matter is intensified and ipso facto purportedly the nutrient supply to the agricultural crops is indirectly improved. In a similar order the tasks of soil tillage were described by Vasinauskas , Makarov , Gajri, Arora, Prihar , parihar, Benbi, Gajri  Tillage for Sustainable Croping, NewYork P.195 and many other authors of various countries of the world. Such explanation of effectiveness of soil tillage process has become universally recognized, even a “classic” postulate, although no reasoned research the weeding of the crop stand-the elimination of the competitors of the cultural plants regarding the nutrients as a task of soil tillage, most often is ignored ghettoized, although the effectiveness of weeding and weeds choking as a direct supply of agricultural crops with nutrients has been proved long ago. Another important methodical drawback of the empirical soil tillage studies, is the fact that in the experiments usually not the whole crop-plant community (agrophytocenosis), but only plant mass grown in it, and often only its part-the yield: Grain, seeds, tubers, roots, fibre is studied. The establishment of the mass of the other part of vegetable production which has grown in that crop-straw, chaff, leaves-is not obligatory. Even in such exclusive cases when the secondary production or the crop weed mass is established, other methods of study, record and evaluation than in evaluating the yield are applied. In establishing the crop weed mass the record data are presented as a separate phenomenon and is not related with the crop productivity. The worst thing is that the conventional agriculture ignoring of weeds as a phytocenotic factor in agriculture (and, first of all, in soil tillage) is nearly universally common in the agricultural studies. Even the widely known in the world specialized scientific magazine “Soil and Tillage Research” exclusively emphasizes the physical, chemical and biological changes provoked by soil tillage and phytocenosic structural crop changes are studied very rarely. Weeds together with plant diseases and pests are discussed in the magazine separately from the cultural plants. Such evaluation of crop when the plants of one community are evaluated differently is unfair and unacceptable from the scientific-geo-botanic viewpoint. If the outcomes of mechanical soil tillage to the soil and crop are evaluated impartially, it is universally recognized that after mechanical ground tillage, many processes take place in the soil and in the crop growing after it, they can be divided to at least four large groups. The first one-loosening, changes the soil density, aeration, humidity and temperature. The second one-chemical processes in it, changes. The third one-in the soil microbiological processes which during the decomposition of the organic matters of the soil indirectly affect the supply of the higher plants with the change in soil nutrients. And finally the fourth group-it is the phytocenosic factor insufficiently appreciated till present, i.e. if you till the soil in a different way, the specific structure of the future crop plant community, its weediness changes. If the processes of the first three groups affect the cultural plants and their yield indirectly, in the case of change of the crop structure, decrease or increase of the crop weediness the nutrition of the cultural plants is affected directly as well. The direct weed competition regarding humidity, solar radiation, plants, nutrients increases or decreases, the biochemical-allelopathic interaction of the community changes as well. The changes of the specific structure in a community according to the data of our studies are equivalent or even more relevant than the changes in the soil caused by physical and chemical factors Lazauskas . In the studies described in this article the biggest attention is devoted to the regular changes of the specific structure of agrophytocenosis and their theoretical and practical evaluation in the discipline of soil tillage. A pretext to study the phytocenosic changes in the crop appeared already in the middle of the 20th century when after the beginning to use very effective herbicides and the essential reduction of weediness of the crop thanks to it, the experiments data that after the killing of the weeds with the help of herbicides the soil tillage can be simplified or it can even be refused completely started spreading in the world. Alas, the author has not happened to find a reasoned theoretical substantiation of this phenomenon till present. Aiming to explain the problem of effectiveness of mechanical soil tillage, already in 1961-1962 we were studying it by growing corn. After spraying the soil with simazine (2 kg/ha) before the sowing of corn and killing the absolute majority of weeds in this way, it appeared that the intensification of loosening of corn row-spacing had become absolutely ineffective and had not increased the yield and very intense loosening of row-spacing (4 times during the vegetation) had even reliably reduced the yield of corn dry matter Lazauskas . The fact that mechanical soil tillage under field conditions is not a necessary factor during the growing of sugar beetroots has been confirmed by the newest experiments performed in Aleksandras Stulginskis University (ASU) [7,8] which proved that after killing the weeds with the help of herbicides even complete refusal of soil tillage had no essential influence on the yield of sugar beetroots tubers. After the spreading of very effective herbicides in the world it has been ascertained that after killing the weeds the intensification of soil tillage (without damage to the yield) can be reduced to the minimum or even refused at all. Alas, the author has not happened to find a theoretical explanation of reasoned minimal soil tillage in soil tillage literature. After the comparison of the data of the studies on the role of mechanical soil cultivation process in soil tillage and its influence on cultural plants it appears that it is expedient to conduct specialized studies on this issue not with a community of cultural plants and weeds of many kinds (as is common in field experiments), but by studying one community plants kind taken separately under accurately controlled conditions of vegetation experiments. The above described field experiments with corn when after killing the weeds with the help of herbicide simazine, only corn was left at the beginning of vegetation and the loosening of row-spacing had not increased the yield and the loosening for four times had essentially reduced the yield of corn dry matter can be considered as classic examples of the studies with one kind of plants Lazauskas . During the studies of one plant kind-barley Kadziuliene  and Zimkuviene, et al. presented very valuable studies data. They in the Lithuanian Institute of Agriculture, in field and vegetation experiments in Dotnuva were studying the influence of soil density on barley growing it in a crop without weeds and have achieved very valuable results. In the mentioned experiments Kadziuliene  was studying how summer barley grown in loos soil density (1 g/cm-3) and tight soil of 1.2 g/cm-3, 1.4 g/cm-3 and 1.6 g/cm-3 density reacts differently. Kadziuliene, after generalizing the data of vegetation studies conducted for three years has established that the most favorable growth and yielding conditions for barley without weeds was not loose (1 g/cm-3), but moderately tight or (from the density of 1.2 g/cm-3 to 1.4 g/cm-3) squeezed soil. It was warmer in comparison with the loose one, the activeness of micro-organisms in it was more intense-notably more CO2 was released. In a denser soil there were bigger amounts of P2O5 and K2O accessible for the plants. It is important that in a soil squeezed by the density of 1.2 g/cm-3 to 1.4 g/cm-3 there was more nitrogen NO3 and NH4 and the most important fact is that in the moderately squeezed soil the biggest barley grain yield was gained. The data of Kadziuliene  studies were essentially complemented by the results of vegetation experiments of Zimkuviene, et al. in which by increasing the soil density from 1.0 g/cm-3 to 1.4 g/cm-3 and under the humidity of 20% and 25% in the soil the effect of the mineral fertilizers improved and the yield of barley grain increased as a natural result. The unique data of the studies of Kadziuliene  and Zimkuviene, et al. have witnessed the baseless of the “theoretic” postulates of the advantage of loose soil published in the soil tillage textbooks of that time. Alas, under the conditions of that time the mentioned data of the studies have remained rightly unappreciated, when the herbicides appeared and the weed control of the crop was essentially reduced, the systems of the simplified soil tillage and even zero soil tillage spread in the world. Other advantages of the settled down soil clarified as well. It was established that in uncultivated or settled down soil erosion makes less detriment, cultural plants are better supplied with plant nutrients, they are even less injured by verticilliosis . In uncultivated soil according to Pigne, et al. more earthworms are found and their mass is bigger than in the case of ploughing or other soil cultivation. Generalizing the data of the studies of the newest systems of the simplified or zero soil tillage one can state that mistaken statements giving land loosening prominence which found their way to the soil tillage textbooks have appeared not on the basis of scientific theoretical studies, but from practical empirical experience already then when the detriment of the competition between weeds and cultural plants was unknown, so it was not perceived that the intensification of soil tillage reduces the weed mass in the crop and thus increases the yield. These contradictions can be reasonably explained by the evaluation of the crop from the viewpoint of agrophytocenology and by recognizing that the agricultural crops together with the weeds growing in them are plant communities-agrophytocenosis (Figures 1-3). Figure 1. Field weed community without crop plant. Figure 2. 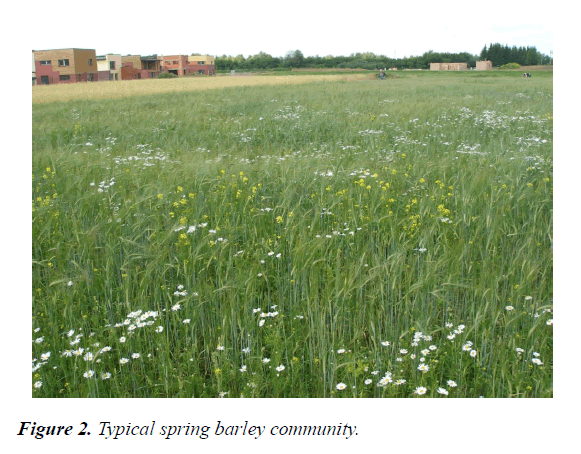 Typical spring barley community. Figure 3. 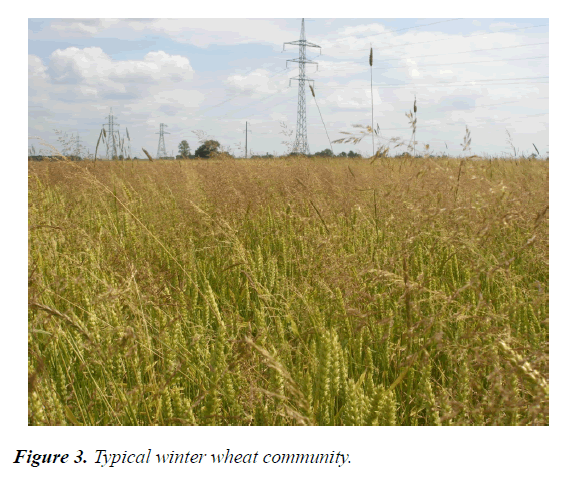 Typical winter wheat community. Actually all the higher plants growing in agricultural crops-agrophytocenosis, the weeds among them as well, have descended from the same higher plants, are uniform and equal members of those communities. All of them according to their opportunities share the crop growing space compete regarding plant nutrients, solar radiation, humidity and other environmental factors. In the crops just as in natural plant communities regular biological processes take place. Experiments and other studies have proved that purposeful reduction of weed mass in the crop-weeding, with the help of herbicides or other means-reduces the weed competition in the crop. Then cultural plants get more soil nutrients, humidity, solar radiation and naturally the yields increase. All the herbicide industry economy is based on it. When the use of effective herbicides spread, it appeared that the intensity of soil tillage can be reduced or even completely refused without any negative effect on the crop yield. Thus the systems of “minimal’ and even “zero” soil tillage discussed by Kant , Hakansson [14-16], Teasdalle, et al. , Erenstein, et al. and other studies spread. It should be noted that during the description of minimal soil tillage studies most often no theoretical assumptions are presented and their contradictions to the traditional postulates of the soil tillage textbooks are suppressed. Usually the authors confine themselves only to the registration of the data of empirical-physical, chemical, biological-soil qualities or simply state that in uncultivated ground the structure of the soil, its biological properties improve, so the yield increases . According to Lindstrom, et al. minimally tilled soil becomes more erosion resistant. Borio, et al. indicated that in the case of completely uncultivated or sparingly cultivated soil, in it more protein secreted by microorganisms (glomalin) is accumulated. According to Lafond, et al. the refusal of soil tillage, just as minimal soil tillage improves the effectiveness of soil water on flax, but no abstract theoretical reasons have been presented. All that enables to state that in the classical soil tillage literature based on empirical experience (without the necessary foundation based on experiments, and following only experience) unreasonable prominence was given to the loosening of soil and the influence of soil tillage on the reduction of crop weeds mass and its effect on the yield has not been studied. The purpose of the study described in this article has been to relate the change of the crop weed mass with the change of the yield of agricultural crops. We were tackling this problem referring to phytocenological cognition methods. By introducing an abstract method of crop evaluation we were striving to promote the progress in cognition of soil tillage from primitive empirical level to a higher level of theoretical-scientific cognition. The described studies of the field plant community (agrophytocenosis) structure and productivity dependences were conducted during the period of 1960-2010 in Lithuania by the fields, greenhouses, laboratories of, experimental station and expeditions. In the field experiments the field area most often was approximately 40 m2. The experiments have been done in four-five repetitions the treatments in the repetitions have been placed in a random way. The vegetative experiments were performed in special Wagner pots with five-or six replications. The studies of allelopathic weed secretions-in laboratories, in standard Petri dishes following the methodology of Grodzinskiy . The estimate of weeds in the crop was made according to the method of little frames (20 x 30 cm) taking 40-80 weed samples in one treatment. The dried weeds were analysed by establishing the species, number and their dry mass. While doing the calculations of the dependence of crop plant yield on weed mass we were referring to the published data of the studies of the author and also of the scientists of various countries in which by the yield data the data of the weed mass of the same treatments were presented. For the treatment of the data of statistical study the methods of dispersion analysis and correlation and regression have been employed. During the soil tillage, as has already been mentioned, the specific structure of the mass of the plants in the crop community changes as well, as the mass of weeds changes, the yield of the cultural field plants in a community naturally changes as well. Herewith the competitive and allelopathic relations change as well. Striving to cognize the essence of those changes studies were begun from the estimate of plant nutrients assimilated by cultural plants and weeds, as their amounts in the soil are most limited of all. In a community competition regarding plant nutrients takes place between cultural plants and weeds. If weeds mass are reduce in the community by soil tillage, herbicides, weeding or other way, the accessibility of plant nutrients to the crop plants increases and vice versa. The elimination of weeds from the crop can be relatively equaled to improving cultural plants provision with nutrients. In field experiments during the studies of the competitive relations of weeds and corn the number of weedings was gradually increased. Four corn crops of different weeds removal (hand weeding)–treatments were formed. At the end of vegetation in the samples of corn and weed mass the amounts of nitrogen (N), phosphorus (P2O5) and potassium (K2O) taken from the soil were established. The data of the laboratory analysis have revealed that the less weeds were in the crop, the more nutrients were assimilated by corn and accordingly weeds got less nutrients (Table 1). Table 1. The amounts of cumulative nitrogen N, phosphorus P2O5, and potassium K2O (kg/ha-1), by maize, by weeds and by all community. From the theoretical cognition viewpoint in this experiment a new and original phenomenon identical to all the community has been established: The amount of nitrogen (kg/ha-2) assimilated by corn and weeds in separate treatments (irrespective of the fluctuation of the weed mass in separate treatments) has remained of conditionally equal amount, the variation coefficient (VC) has reached only 3.4% (Table 1). A similar tendency has remained with both phosphorus and potassium as well, although the variation coefficients have been a bit larger-that of phosphorus has reached 7.8% and of potassium-13.5%. The calculated correlation-regression dependence between the substances like nitrogen, phosphorus and potassium, taken from the soil by corn and weeds has been negative, strong and essential, the nitrogen correlation coefficient-0.724, when t=3.8, phosphorus-0.699, when t=3.49 and potassium-0.849, when t=5.67. We have established analogous negative correlation dependence during the assimilation of nitrogen between barley and weed Holcus molis. The data of the results of vegetation experiments studies of Mann [23-25] and the results of corn grown in field experiments by Soroka, et al. certify that the correlation coefficient for nitrogen-0.732, when t=3.06, phosphorus-0.796, when t=3.73 and potassium-0.854, when t=5.67. The data of all these studies enable to state that the competitive damage of weeds growing in crop is inverse and equivalent to the weed mass in the community. After establishing the regular inverse, correlation and regression dependences of the nutrients assimilated from the soil by cultural plants and weeds, following them an assumption that the weeds mass can be conditionally recognized as yield antipode was made and on this basis the abstract correlation-regression dependences of the yield of cultural plants on the weed mass can be calculated. The validity of such assumption has been confirmed by special vegetation and field laboratory studies. For the confirmation of the calculations of the studies data the data of the studies published by the other authors were employed as well. During the studies of the dependence of the yield of cultural plants on the weed mass in vegetation Wagner pots, we have analysed the influence of increasing barley plants concentration on field mustard (Sinapis arvensis L.) In the six treatments of experiment a coherently increasing number of barley plants i.e 3, 6, 9, 12, 15, 18 in a pot were grown. Together with them in every pot, 6 field mustard (Sinapis arvensis) plants were grown. The empirical experimental data of the research have indicated that the increase of the barley plants number in a pot have decreased of field mustard mass of the community. And contrary increasing of the number of spring barley in the pot coherently increased the mass-yield of barley plants in a pot. It essentially was biggest in the sixth, densest treatment (Figure 4a). Figure 4. 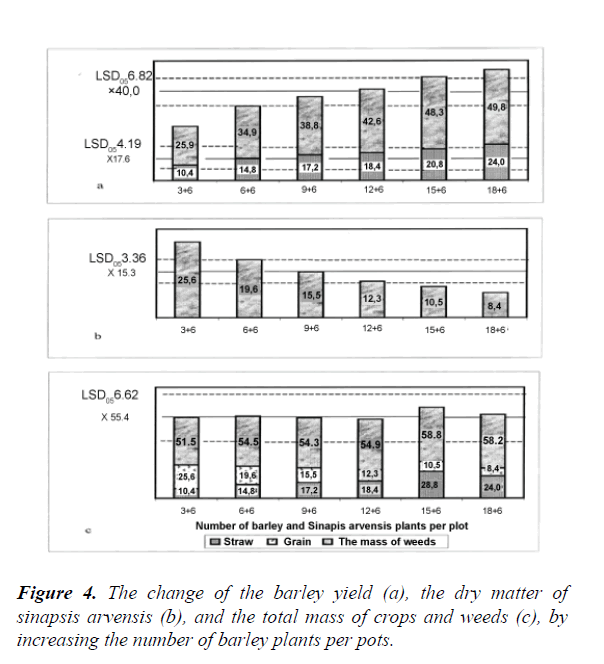 The change of the barley yield (a), the dry matter of sinapsis arvensis (b), and the total mass of crops and weeds (c), by increasing the number of barley plants per pots. The field mustard mass was changing contrariwise-as the barley number in the pot increased, the field mustard mass was essentially decreased. In the first variant in which were growing only three barley plants and plus six field mustard plants mass was the largest. As the number of barley plants in the pot increased, field mustard mass was gradually regularly and essentially decreasing. In the sixth treatment in which 18 barley and 6 plants of field mustard were growing field mustard mass was the least (Figure 4b). It certifies that as the number of barley plants in the pot increased, barley was stronger choking field mustard plants. The reduction of field mustard mass in comparison with their average mass in the experiment was essential. In the first two and last two variants-treatments the deviations from the average were essential, bigger than the limit of the reliable difference-LSD05 (Figure 4b). From the viewpoint of scientific-theoretic cognition the novelty and originality of the data of this experiment is that irrespective of how many and what kind of plants were growing in one pot (treatment), the overall grown mass of all community the crop-barley and weed-field mustard in a pot (in separate treatments) has remained relatively equal (Figure 4c). Its difference are inessential, the mass has been essentially less that the limit of essential difference R05 On the basis we can state that in this experiment although the studies crop was formed artificially and had a varying specific structure, the amount of overall organic mass cultivated in all the separate treatments has remained of relatively equal size. That is confirmed by the weak variation of overall vegetable mass as well-Cv=4.9%. Following the presented empirical data of the studies one can state that during these vegetation experiments between the yield of cultural plants and mass of weed field mustard mass original inverse yield dependence on the mass of weeds which manifests regularly has been established. It has not been described either in soil tillage or herbology. Striving to evaluate that dependence in the abstract a method untraditional for soil tillage studies-the establishment of correlation-regression dependence of barley grain and straw yield on field mustard mass has been invoked. The performed calculations (Figure 5) have indicated that during all the three years of experiments the dependence of the yield of barley grain and straw mass on artificially field mustard mass was negative, strong and essential. Figure 5. 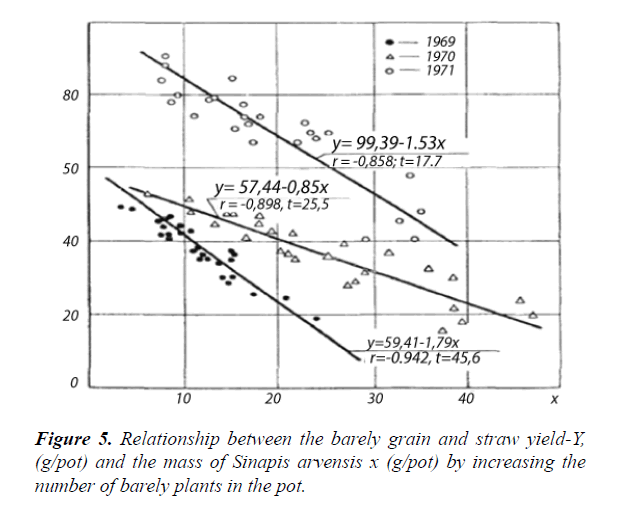 Relationship between the barely grain and straw yield-Y, (g/pot) and the mass of Sinapis arvensis x (g/pot) by increasing the number of barely plants in the pot. According to them the increase or decrease of the mass of any components of the crop-barley, or field mustard-determined a regular inversely proportional change of the mass of another community component in the opposite direction. Aiming to verify the universality of the discussed dependence another experiment with an opposite study scheme was performed. During it in all the treatments an equal number of barley plants-six barley plants per pot and increasing number of field mustard (Sinapis arvensis L.) plants per pot -3, 6, 9, 12, 15 and 18 was grown. Although the experiment scheme was diametrically opposite to the vegetation experiment described above, in this experiment which was performed during two years as well the correlation regression dependence of the yield of barley mass on the increasing field mustard mass has been also analogous to the vegetation experiment described above. The dependence of barley yield on field mustard mass has been practically the same: on the first year: Y=17.78-0.90; R= -0.728; t-6.55. On the second year: Y=15.95-1.54x, R= -0.968, t-23.1. Following the data of the vegetation experiments of five years one can state that irrespective of the number of what components of the community-barley, field mustard per pot was increasing or decreasing, the dependence of barley yield on field mustard mass has remained the same-inversely proportional to field mustard mass, and the form of dependence of barley yield on field mustard mass has been equally negative, strong and essential. From the practical viewpoint vegetation experiments are not analogous to field conditions, as in the described studies only one kind of weeds-field mustard (Sinapis arvensis L.) was representing weeds, and in the field crops many various kinds of weeds are found. Aiming to verify the described dependence of the yield of cultural plants on weeds mass under field conditions special field experiments were performed. In them different weed species of the crop was formed by different weeding according to the following scheme: in the first, control treatment the crop was not weeded; in the 2nd, 3rd and 4th treatments the crop was weeded accordingly once, twice and thrice. In the experiment with corn (the 4th variant) the crop was weeded four times. R= -0.809; t=5.06; 1971: Y=50.93-0.30X; R= -0.866; t=4.67. Here: Y-yield of barley grain deci t/ha-1; x-weed field mustard mass of barley crop g/m-2. In a field experiment with corn performed according to analogous scheme the dependence of the yield of their green mass on the crop weeds mass in a crop weeded in various ways was analogous to the dependence of the yield of barley grain on the weeds mass described above-1969: Y=560.0-0.809x; R= -0.999; ( t=59.1); 1970: Y=703.5-0.868x; R= -0.709; (t=3.5); 1971: Y=425.2-0.527x; R= -0.855; ( t=5.2). Y-yield of corn green mass deci t/ha-1, X-weed mass of corn crop stand g/m-2. During the research of the manifestation of the described dependence of field crops yield in the crops of different cultural plants in Lithuania and other countries of the world the data of the studies of various authors published in scientific literature have been analysed (Tables 2 and 3). After the exhaustive evaluation of the abundant studies published by various authors covering the period of 80 years and a variety of soils of global extent, big number of kinds of cultural plants and very various weeds communities and different means of weed control it has appeared that everywhere the same negative yield dependence on the crop weeds mass as in the experiments performed by us has been established. So we can soundly state that the dependence of the yield of cultural plants on the weed mass is a universal regular phenomenon manifesting itself in the analogous way in the entire world. Everywhere its essence is competition regarding the plant nutrients present in the soil: Nitrogen (NO3 and NH4), phosphorus (P2O5) and potassium (K2O). It is natural that the inversely proportional dependence of the yield of the agricultural plants to the weeds mass repeats, as time flies. Its manifestation has been established during the experiments performed 80 years ago (Table 3) [27,28], it also repeats in the latter years (Table 2) [29,30]. Table 2. Agricultural plant yield subordination to the weed mass, calculated according to various Lithuanian academic experiment data. Table 3. Agricultural plant yield subordination to the weed mass, calculated according to various worldwide academic experiment data. In the article the results of the studies performed by author of the article during fifty years have been generalized which essentially coincide with the data of the studies published by the scientists of various other countries of the world, the author refers to the statements of agrophytocenologists that traditional agricultural crops are artificial communities of higher plants (agrophytocenoses) consisting of cultural plants and weeds to which the qualities of natural higher plant communities, competition regarding the environment factors, allelopathy and others are typical. It is known that all the plants of agrophytocenosis descend from the same natural higher plants kingdoms, they feed on the same plant nutrients and soil humidity, use the same solar radiation and finally perform nearly alike photosynthesis. Under the same environmental conditions the productivity of the cultural plants becomes inversely proportional to the mass of the crop weeds. During the studies this statement was confirmed in practice. In taking various agro-technical measures and reducing the weeds mass in the crop-community, when they are controlled or choked by agro-technical, mechanical, chemical, thermal or other means and ipso facto the conditions of growth of cultural plants are not worsened and the very cultural plants are not injured, the yield of cultural plants increases. Contrariwise as the weed mass in the crop increases, the yield decreases. That is a necessary and regular phenomenon. The inversely proportional dependence of agricultural crops yield on the weed mass manifesting itself in typical crops-agrophytocenosis under equal environmental conditions is universal. It manifests itself naturally in the same way in the agricultural crops of various kinds when growing them in vegetation pots, experimental fields and entire production crops and does not depend on the local climatic and meteorological conditions, type of soils, kind of cultural plants. It manifests itself equally naturally in ASU Research Station-in Dotnuva, Joniskelis, Voke, Elmininkai (Table 2). In the same way, it manifests itself as a natural result in different continents-Europe, Asia, Australia and America as well (Table 3). The discussed dependence of the agricultural crops yield on the weeds mass can be simply verified by invoking the data of the experiments of any world scientist in which under equal conditions of plant growth and without injuring the cultural plants and not worsening the conditions of their growth, by controlling or choking the weeds in any way, the community weeds mass changes. The discussed dependence can also be verified by studying the equal, whole in the most overall features managemental crop and by diligently taking in it not less than 50 samples of weeds and cultural plants mass in accidental plots of 0.1 m-2, in the places of a crop with varying weediness. Here: A-possible largest productivity of all the community of cultural plants; Y-yield of cultural plants under the present conditions of weediness; X-weed mass of the crop in mass units b-coefficient of yield depression indicating how the yield of the cultural plants will change in case of change of weed mass in the crop by one unit. The law of crop performance productivity as any scientific law is theoretical. The calculations done according to the equation described above are of general character and coincide with the specific data of the studies only within the limits of the discussed conditions and accuracy. The law of crop performance productivity ought not be applied when the compared crops (treatments) differ in more than one difference, cultivated in the soils of different type, humidity and fertilization; when during the controlling weeds by herbicides or other means the cultural plants are injured, when they are choked or otherwise interfere with the growing and yielding of cultural plants; grow after different predecessors. The application of the original law of crop-community (agrophytocenosis) performance productivity in the subject of soil tillage will reverse the primitive empirical cognition method based on experience applied in it and turn soil tillage to a classical science. Both any progress of scientific cognition and application of the crop community-agrophtytocenosis performance productivity law will become serious progress leverage for the evolution of soil tillage science cognition and improvement of practice. During the projection of the technologies of agricultural crops one will have to follow the applied phytocenology-agrophytocenology, to use acknowledged geo-botanical methods of research for studies wider. By focusing the principal attention on the yield as has been most frequently done yet as well as to the performance productivity of the whole community of field plants-agrophytocenosis. So we would also have to refuse the very old name of soil tillage discipline and “science”, instead of it the name of “applied agrophytocenology”, “agrophytocenology” or a similar name which more precisely defines and corresponds to the new essence of soil tillage better ought to be used. Vasinauskas P. Bendroji agrotechnika. Vilnius.P. 1989;231(1):22. Makarov IP. Zemledelie obrabotka pochvy. Moskva. S. 1991:271-383. Gajari PR, Arora VK, Prihar SS. Tillage for sustainable croping. New York. 2002;195-202. Prihar SS, Gajari PR, Benbi DK, et al. Intensive cropping; efficient use of water, nutrients and tillage. Abingdon. 2000;264. Lazauskas P. Agrotechnika prieš piktžoles. Vilnius.1990;216. Lazauskas P. Simazino ir atrazino naudoji­mas kovai su piktžolėmis kukurūzų pasėliuose. LŽŪA mokslo darbai. 1963;3(19):95-107. Romaneckas K. The effect of conservation primary and zero tillage on soil bulk density. Agron Res. 2009;7(1):73-86. Romaneckas K, Pilipavičius V, Trečiokas K, et al. Agronomijos pagrin­dai. Akademija. 2011;340. Kadžiulienė G. Dirvos tankumo įtaka kai kurioms dirvos fizinėms savybėms bei miežių der­liui. Informacinis biuletenis. 1971;23:28-42. Zimkuvienė A, Tindžiulis A. Drėgmės ir tręšimo įtaka optimaliam dirvos tankumui, augi­nant miežius. Lietuvos žemdirbystės MT instituto darbai. T. 1974;28:21-30. Šimon TM, Javurek O, Mikanova O, et al. The influence of tillage system on soil organic matter and soil hydrophobicity. Soil Tillage Res. 2009;105(1)44-48. Pigne J, Cannvaciuolo M, Gautronneau Y, et al. Earthworm populations under different tillage systems in or­ganic farming. Soil Tillage Res. 2009;104(2)207-214. Kant G. 1976. Ackerbau ohne pflug. Stuttgart. 158. 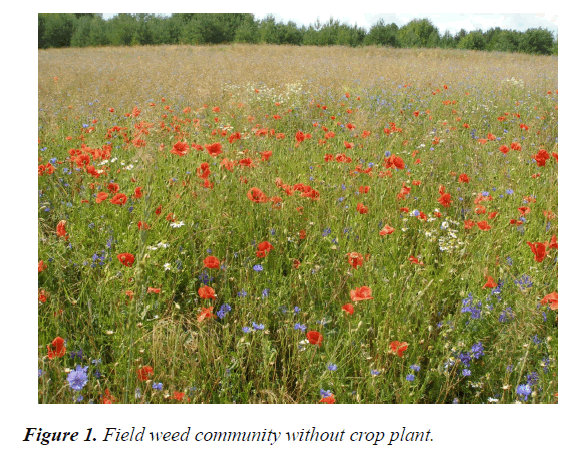 Hakansson S. Weeds and weed management on arable land: An ecological approach. Swedish University of Agricultural Sciences. 2003:274. Hàkansson S. Competition and production in short-lived crop-weed stands. Density Effects. Uppsala. 1983:p85. Hakansson S. Row spacing, seed distribu­tion in the row, amount of weeds: influence on production in stands of cereals. Weeds and Weed Control: Proceedings of the 25th Swedish Weed Conference. Uppsala. 1984;17-34. Teasdale JR, Bransaeter LO, Calegari A, et al. Cover crops and weed manage­ment. Non-chemical Weed Management. 2007;49-64. Erenstein O, Laxmi V. Zero tillage im­pacts in Indias rice-weat systems. Soil Tillage Res. 2008;100(1-2):1-14. Lindstrom MJ, Schumacher TE, Blecha ML. Tillage effects on water runoff and soil erosion after sod. J Soil Water Conserv. 1998;53(1):59-63. Borio F, Rubio R, Rounatel JL. Effects of tillage systems on soil characteristics, glomalin and micorrhizae propagules. Soil Tillage Res. 2006;88(1-2):253-261. Lafond GP, May WE, Stevenson FC, et al. Effects of tillage systems and rotations on crop production. Soil Tillage Res. 2006;89(2):232-45. Grodzinskiy A. M. Growth inhibiting substances. Kiev. 1965;198. Mann HH, Barnes TW. The competition between barley and certain weeds under control­led conditions. Ann Appl Biol. 1945;32(1):15-22. Mann HH, Barnes TW. The competition between barley and certain weeds under control­led conditions; competition with Holcus mollis. Ann Appl Biol. 1947;34(2):252-66. Mann HH, Barnes TW. The competition between barley and certain weeds under control­led conditions; competition with Agrostis gigantea. Ann Appl Biol. 1949;36(2):273-81. Soroka SV, Soroka LI. Evaluation of interaction between weed infestation and yield of oat in Belarus. Proceedings of the International Weed Control Congress. Copenhagen. 1996;253-58. Kozlova V. Harvest some cultivated plants and weeds in pure and mixed crops. Bulletin of the publishing house of the Experimental Agronomy. 1930;35:1-26. Shevelev IN. Weediness of the fields of Ukraine and agrotechnical measures to combat it. Materials of the 2nd All-Union. meeting weed control. 1935;23-29. Maikštėnienė S, Velykis A, Arlauskienė A, et al. Sustainable agriculture in productive soils. LUA Academy. 2008;327. Deveikytė I. Sugar beet. Agribusiness, research, technology: Monograph Academy. 2009;255. Mikalajūnas J. Supervisory influence on the potato harvest in the soils of the Lithuanian SSR in the soils of the LSSR. T. 4. P.1967;383-412. Gudynas KV. Change in weed infestation of barley and winter wheat during harrowing. Lithunian Academy of Agriculture. 1973. Petrulis J. Impoverishment of winter wheat. LUA Scientific works.1982; 2(90):45-54. Stancevičius A, Švagždys ST. Frequency and depth of layered ariam black felling. LUA Scientific works. 1972;1(47)125-33. Stancevičius A, Arvasas J, Petrulis J. Weed control in the autumn tillage system. LUA Scientific works. 1973;1(50):309-25. Stancevičius A. Investigations of the Lithuanian SSR Crop Certificate. LUA Scientific works. T. 6. Nr. 1. P. 1959;3-150. Kadziauskas P, Blažienė S. Autumn tillage in light soils. Agronomy. 977;15-28. Tindžiulis A, Baniūnas V, Kavoliūnaitė I, et al. Comparison of shoots and early growth. LŽMTI works. 1974;47-60. Kučinskas V. The effect of insertion of the fallback and local nitrophosis on the barley yield. LŽMTI Young scientists' works on intensifying agricultural production.1979;7-9. Čaikauskas V. Influence of weed quantity on sugar beet yield and sugar content. LŽŪA Materials of the scientific conference of the teachers of the XVL. 1971;103-6. Rapkevičienė A. Herbicides in pasture. Farming. 1970;p27. Gudelis PK. Selection of predecessors for flax. Abstract of the degree of candidate of science. 1967;p25. Kviklienė N. Primenenie gerbicidov na po­svakh ovoshchnogo gorokha. Kratkie doklady po voprosam zashchity rasteniy. T. 3. S. 1972;187-90. Kazlauskienė O. Herbicides in the meadow. Farming. 1970;27. Nedzinskas A, Lazauskas J. Preliminary soil preparation for green limes. 1975;50-4. Collins M, Roce J. Weed control in lupins using a new spray shield and other row crop techniques. Proceedings of the 13th Australian Weeds Conference. 2002;484-6. Dhammu HS, Sandhu K. Critical period of ciperus iria l. in transplanted rice. Proceedings of the 13th Australian Weeds Conference. 2002;79-82. Ping LS, Tao NX. Effect of interplanting with zero tillage and straw manure on rice growth and rice quality. Rice Science. 2007;14(3):204-10. Upadhyay QA, Khan A, Hdawate HD. Studies on weed management sorghum. Proceedings of the 7th Asian Pacific Weed Scientologist Coc. Conference. 1979;95-7. Knake EL, Slife FW. Competition of setaria faberii with corn and soy beans.Weeds. 1962;P. 26-9. Knake EL, Slife FW. Effect of time of giant foxtail removal from corn and soy beans. Weed Science. 1969;17:281-83. Andreev A, Lazauskas P. Vredonosnost sor­nyakov v posevakh lna. Zashchita rasteniy. 1978;27-8. Levin MC, Oyaveski L. Opyt borby c co­pnyakami v posevakh khimichiskim metodom. Tallin. 1961;83 s.
Yaduraju NT, Ahuja KN. Effect of soil solarization with or without weed control on weeds and productivity in soybean-weat system. Proceedings of the 2nd International Weed Control Congress Copenhagen. P. 1996;721-7. Pons TL. Growth rates and competitiveness to rice of same annual weed species. Proceedings of the 7th Asian Pacific Weed Scientologist Coc. Conference. 1979;65-9. Maksimenko LD. Sornyaki i urozhay ku­kuruzy. Osnovnye itogi nauchnykh issledovatelnykh pabot za 1956–1967. Stavrapol. 1972;72-5. Gruzdev G, Slovcov R. Zavisimost urozhaja i khimicheskogo sostava sakharov svekly ot zaso­rennosti posevov. Izvestya TSXA. 1968;68-74. Tukhtaev J. Vliyanie sposobov i glubiny os­novnoy obrabotki pochvy na urozhai khlapchatni­ka v usloviyakh severnykh rayonov Tadzhikistana. Trudy Tadzhikskogo CXI Dushambe. 1971;3-12. Vorobyov N. E. Kukuruza i sornyaki. Kukuruza. 1964;30.